The objective of this paper is to examine the social role of sport in facilitating community development through the notion of social capital. The aim is to investigate how social capital develops and operates in order to engage Muslim women. The social inclusion of Muslim women in community sport organisations which promote cultural diversity and gender equity is investigated. This social role of sport in facilitating social justice, active citizenship, and community development within society has been linked to the notion of social capital (Arai & Pedlar, 2003; Auld, 2008; Blackshaw & Long, 2005; Coalter, 2007; Collins & Kay, 2003; Doherty & Misener, 2008; Jarvie, 2008; Nicholson & Hoye, 2008; Rojek, 2005). 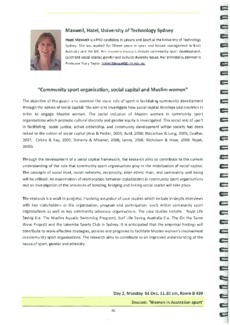 Through the development of a social capital framework, the research aims to contribute to the current understanding of the role that community sport organisations play in the mobilisation of social capital. The concepts of social trust, social networks, reciprocity, inter ethnic trust, and community well being will be utilised. An examination of relationships between stakeholders in community sport organisations and an investigation of the processes of bonding, bridging and linking social capital will take place. The research is a work in progress, involving a number of case studies which include in-depth interviews with key stakeholders at the organisation, program and participation levels within community sport organisations as well as key community advocacy organisations. The case studies include: Royal Life Saving (i.e. The Muslim Aquatic Swimming Program), Surf Life Saving Australia (i.e. The On the Same Wave Project) and the Lakemba Sports Club in Sydney. It is anticipated that the empirical findings will contribute to more effective strategies, policies and programs to facilitate Muslim women's involvement in community sport organisations. 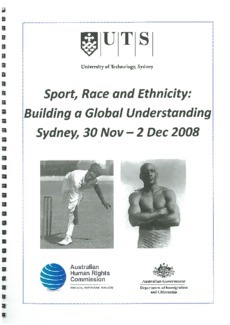 The research aims to contribute to an improved understanding of the nexus of sport, gender and ethnicity.